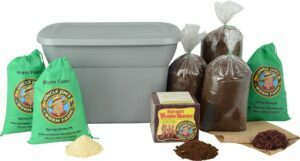 The kit comes with 2,000 composting worms by default. European Night Crawlers can be substituted at an additional cost. The biggest bloat we have, our Ranch kit. This doesn’t come in some dinky 6 inch tall container, but instead, an 11 inch deep, thunder tub! Serious wormers only, because this tub is no joke; bloated with bedding and feed for 2,000 red wrigglers, enough room for maximum breeding, and plenty of space to stuff your table scraps to make a miniature composter! 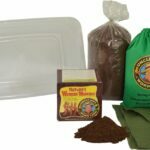 This kit is the fastest way to get some serious production started from your worms, and the quickest way to witness the benefits from worms! Free Shipping! * excludes Puerto Rico and Alaska – additional charges may apply. 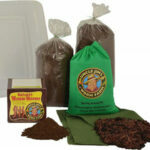 With the shipping of the worms, all the way to California , a lot can happen. Uncle Jim’s worms stood not only behind there statement, they shipped out a second batch to me. The worms are doing great and are excited to have the worms for the garden and the chickens! Great ! My husband is having a blast with all his new little wiggly friends!